We dedicate this month's Time Capsule to Luciano Pavarotti, who died on September 6, 2007. 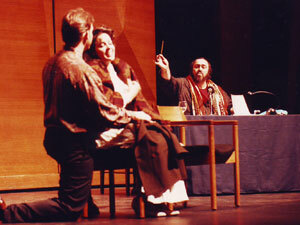 Luciano Pavarotti conducting Juilliard students in a scene from Puccini's La Bohème at a master class in 1991. 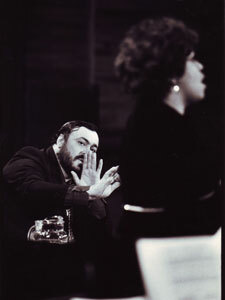 Pavarotti working with Pamela Mann at a 1979 Juilliard master class. 1991 October 30, tenor Luciano Pavarotti worked with Juilliard singers on Italian opera arias in the first of two master classes. Nearly 1,000 people attended the ticketed event. The second class, held two weeks later, featured a performance of the final act of La Bohème by six students. Pavarotti also presented master classes at Juilliard on January 11 and 15, 1979; November 19 and 22, 1987; and February 1, 2001.